Due to a series of increasingly contentious negotiations with the Ministry of Education (MOE), the Belize National Teachers Union (BNTU) held a demonstration rally through the main streets of Belmopan City on Wednesday, November 7th. Those rallying are demanding the MOE provide hardship allowance for schools in remote communities and agree to Proposal 22, which speaks of the Ministry paying 100 % benefits to teachers and support staff of grant-aided secondary schools. The statements by the Prime Minister and the Minister of Education were the spark for the BNTU mobilization. BNTU National President, Hon. Senator Elena Smith, characterized Minister Faber’s comments as being disrespectful. “We note that in the comments that the Minister made he has been quite disrespectful to the BNTU and he continues to do so. We will not tolerate, as we have said before, the Minister being so disrespectful, and his people under him, being disrespectful to the BNTU. He is the same person who wants to be the leader of this nation. You want to be the leader and you can’t be honest? Who do you think will trust you? This Minister needs to get his act together. Don’t put things out there about the BNTU if you don’t have it in writing. We have the black and white and we can show you that. Enough of writing press releases and enough of having these press conferences because it seems as though persons think that we are playing around. But if you can see us right now this is just the beginning of what is to come. So, if you want to know what will come, we will let you know what will come,” she said. According to Smith, the arrangement of the Proposal 22 is not being implemented by school’s management leaving teachers with only 70% of their gratuity and pension. 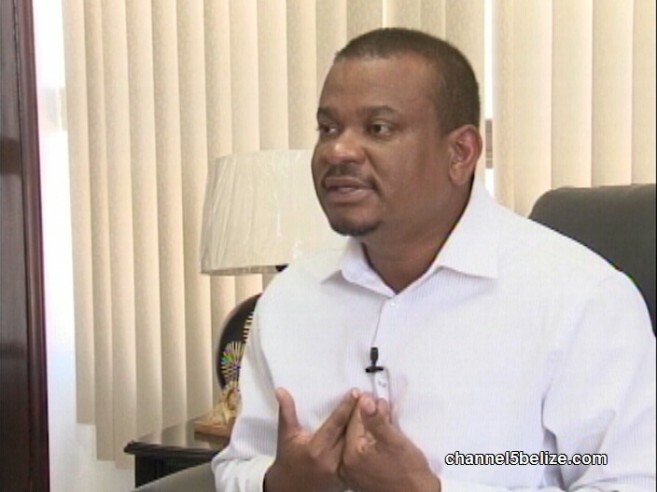 The negotiations, however, have stalled and last week Prime Minister Dean Barrow made it clear that after discussing it in Cabinet, G.O.B. would not be able to financially contribute the 30 %. Soon after, on Thursday, November 1st during the BNTU Branch Leaders meeting, they announced plans to rally on the streets until then GOB gives them what they deserve. In a message tailored especially for the MOE Smith stated the BNTU is not alone. “In case he thinks BNTU is all alone; we are not alone. We will let you all know that if there is a need, we are going to be discussing with our other fellow unions to see how it is that if there is a need for any support, we can get support from them. And if it is that we need to go international for support on this matter, we will do so, because we are not going to let it go. We remain strong, we remain committed to our members and we will fight to the bitter end to ensure that our members get what is rightfully theirs.” The BNTU is a part of the Joint Union Negotiations Team (JUNT) which includes the Association of Public Service Senior Managers (APSSM) and the Public Service Union (PSU). In addition, on Tuesday, November 6th the People’s United Party (PUP) expressed their support to the BNTU. “The union representatives say that they are fighting for the natural justice of all teachers and utterly frustrated with the disrespect shown by the Minister of Education, who has continuously been impolite to the teachers in public. The PUP believes that our teachers are very important to the shaping of our society. They are a key to inculcating values in our children and are central to the development of our nation,” said the PUP. 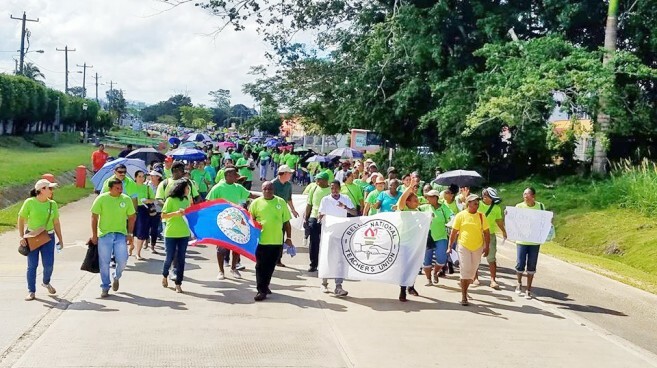 On Wednesday, November 7th at around 9AM, over a thousand teachers from across the country gathered in front of Belmopan Comprehensive High School and marched through the main streets of the Capital. 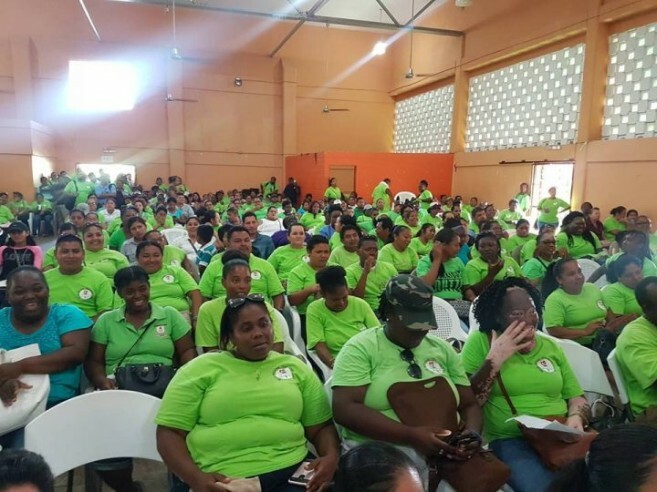 With the majority of teachers wearing their symbolic green shirts and carrying posters, they made their way to the Belmopan Civic Center. At the center, attendees were addressed by various members of the union and even members of supporting organization. Other BNTU speakers for the day included President of Corozal Rural Branch Arodi Montejo, President of San Ignacio Branch Jorge Mejia and President of the Benque Viejo del Carmen Branch. The BNTU was joined by several other labour groups, including the President of Christian Workers Union Evan ‘Mose’ Hyde, and the President of the Public Service Union Doreth Cayetano Obermayer. 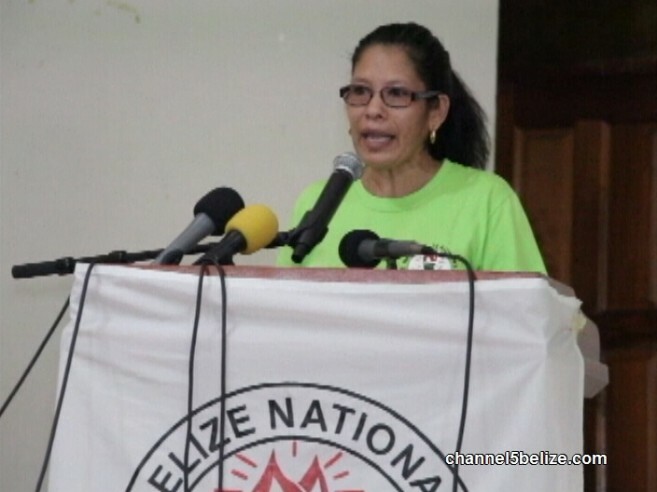 The leaderships of the People’s United Party John Briceno and the Belize Progressive Party Patrick Rogers also lent their support in the fight. Briceno stated they stand in solidarity with the teachers. “We in the People’s United Party believe that the teachers are the bedrock of our society and that we need to show that support, especially in a just cause when the teachers are saying that it is not fair to have some teachers getting their full retirement and others in the high school system not getting their full retirement benefits. I think it is unfair and we need to speak out on their behalf and to also tell the government that we need to be able to work closer with the teachers and give them the support that they need,” he said. However, Hon Faber stated that this demonstration is unnecessary. “I believe it’s an unnecessary demonstration because the discussions have not gotten to the point where there is an impasse. Certainly all Belizeans would have heard me say repeatedly that in fact, even as we speak there is an opportunity afforded to BNTU and our managements to be able to share their concerns as it relates to the hardship allowances. So there is no breakdown in communication and in fact, this matter, if we would have agreed to sit at the table a long time ago to talk about them, could be resolved. This and other issues,” he said. On Thursday, November 8th the BNTU officially stated that Hon. Patrick Faber has agreed to meet with them in order to discuss the matter. “Minister Faber has finally conceded to meeting with us and has committed to work alongside us to adress the issues we have highlighted. We therefore look forward to charting the way forward and will hold him to his words to ensure our members are given what they justly deserve. We have always been ready and willing to sit at a table to adress our members’ concerns. We will approach Monday’s meeting with open minds and are hopeful that we will make satisfactory progress. However, should the opposite happen, our members are prepared to take the next steps,” said the BNTU in an official press release. They further thanked all who contributed to their successful demonstration and rally in Belomopan City. The BNTU assured that they will remain the strongest and most vibrant trade union in the country and will continue to grow from strength to strength, with the help and support of the Belizean people. The teachers union has earned a reputation as an activist union, not only for their own concerns such as benefits and salaries, but also for public affairs and transparency in the government.